Start planning your trip to the Galapagos Islands and you’ll soon realize that you’ll need to make some definite choices before you start packing. The best way to travel around the Galapagos Islands is, obviously enough, by cruise. However, the kind of cruise you choose to take will make a world of difference to your experience. The way we see it, there’s no such thing as a bad trip to the Galapagos. Visiting one of the world’s most special corners, brimming with incredible wildlife and utterly surreal landscape, will either be a great trip…or a mind-blowing AMAZEBALLS trip! Map of the Galapagos Islands. Photo credit: Shutterstock. The Galapagos archipelago is made up of almost 20 main islands and about 100 rocky islets. Of these, only a few are inhabited. Santa Cruz is home to the main airport, and it is here that twice-daily flights connect to the Ecuadorian capital, Quito, and coastal hub of Guayaquil. Flight from the latter are slightly cheaper but note that availability of seats can be an issue as flights run only every other day. Travel to the Galapagos is restricted which means that planning and booking ahead are highly recommended, especially in holiday season. These restrictions also extend to the number of yachts allowed to cruise about at any given time. Altogether, the Galapagos cover an area of over 50,000 square kilometres, which is a pivotal factor when deciding your mode of travel. Transfers between islands can take from 2 to 5 hours, on average. 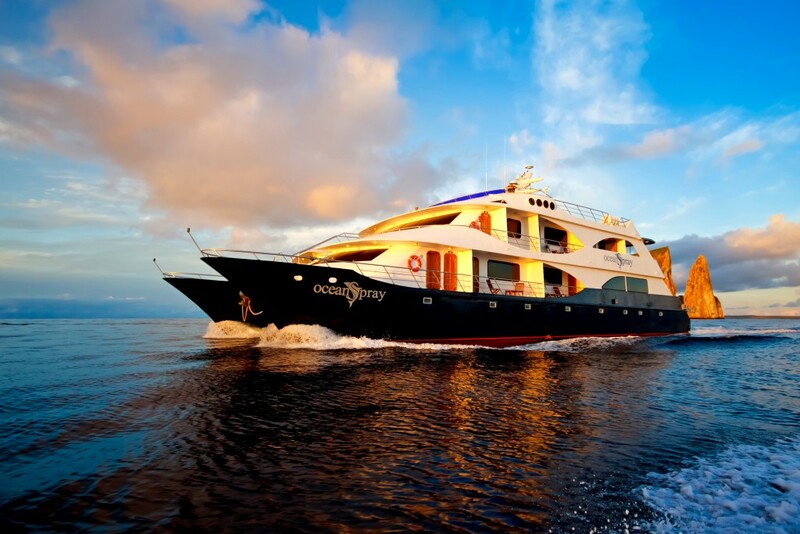 The Ocean Spray is a popular luxury vessel for those wanting to travel around the Galapagos Islands by cruise. Once you’ve happily landed on Santa Cruz Island, you’ll either be joining your all-inclusive cruise or going at it independently. 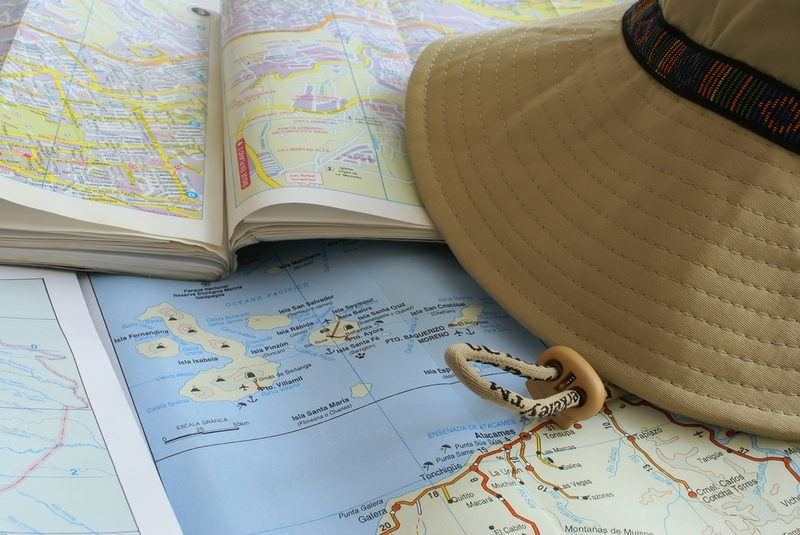 Independent land-based touring – Frugal travellers are often tempted by the option of travelling around the Galapagos independently. Yet at the end of the day, unless you have weeks and weeks up your sleeve, you just won’t get your money’s worth and risk not coming home with a truly comprehensive Galapagos experience. That’s because this is not a cheap place to get to. More importantly than money, is the fact that half of your time will be spent just getting from A to B. Only a couple of islands offer overnight accommodation, so 90% of the time you’ll only be making day trips. With an average of 6 hours of travel just to get to and from…how much time will you have on land? It’s also worth noting that day trips only offer one destination, as opposed to cruising which usually include two landings a day. Nevertheless, there are accommodation options on Santa Cruz, Isabela, and San Cristobal, with boat transfers connecting all three, so although not the savviest option if you only have one week available, it is indeed doable. The Finch Bay Hotel Island Escape is a great choice which offers you the freedom to select the activities such as: hike to Tortuga Bay, swim, snorkel, enjoy the sun at the beach or the pool side, photograph and observe the wildlife and stroll around the village of Puerto Ayora. Many cruising novices, who fear suffering from sea sickness, think that a land-based experience is a safer bet, but that’s not necessarily true. Day trips are usually undertaken in small boats (which can be wickedly unsettling on the stomach) as opposed to larger cruise boats which are not only much more stable but also sail mostly at night, when you’re fast asleep. All-inclusive cruises – Revered for offering the best value for money, all-inclusive cruising options are indeed your best bet if you want to squeeze the living daylights out of a Galapagos Island adventure. 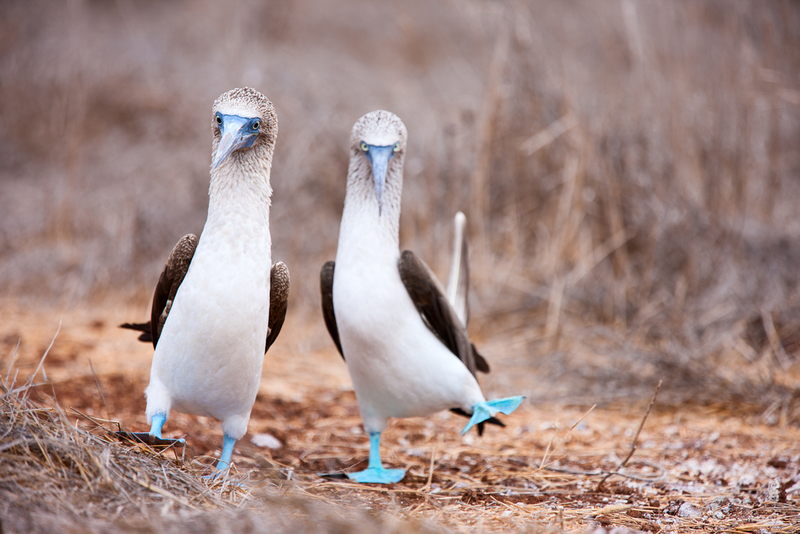 Multi-day cruises can take a great Galapagos trip and turn it into a once-in-a-lifetime adventure. This is where the amazeballs part comes in! 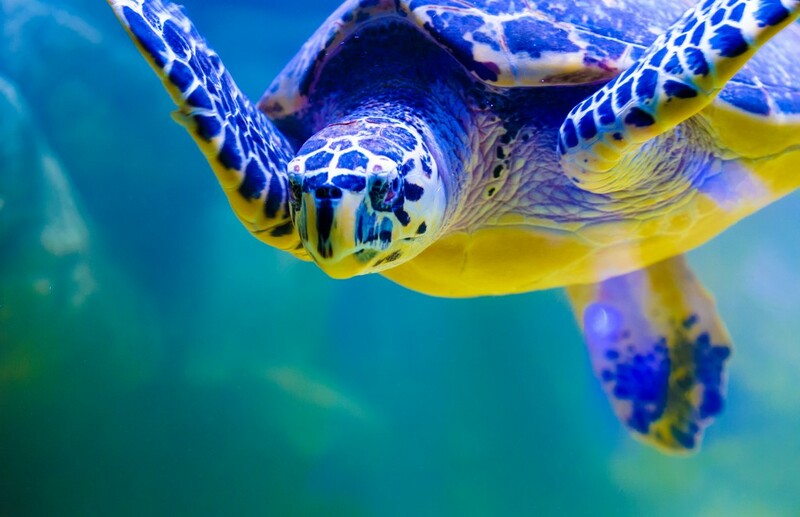 Underwater Galapagos turtle photo credit: Shutterstock. Join a weeklong cruise and you’ll visit about 4 to 5 islands and will easily have more than a dozen shore landings. A typical day would involve landing ashore straight after breakfast for an invigorating walk, and snorkeling among turtles and seals as your lunch is being prepared. After lunch? Well…you can do it all again. The sheer variety and quantity of wildlife spotting, hiking, snorkeling and diving, every single day, is simply unparalleled. You’ll cruise to the next destination at night, and wake up just off the coast of a brand new island every morning. For this luxury alone, cruises are priceless. Add to that an all-inclusive deal, where all your food, guided tours and snorkel gear are included, and it is by far the most enjoyable and stress-free option of all. Can you afford a cruise? Then book it, pay it, forget about the price and look forward to one of the most magnificent travel experiences of your life. Can’t quite stretch the budget enough for a cruise so think you want to go it alone? Do yourself a favor: wait, save some more, and then visit on a cruise. You’ll still be forking out some serious hard-earned cash when you visit independently, yet we can pretty much guarantee you’ll come home craving more, and wishing you’d just booked a cruise instead. A longer wait, in this case, is infinitely better than a regret. There is a limited number of boats which are licensed to take passengers around the Galapagos Islands. Luckily, they vary greatly in style, comfort, and size, so finding an option to suit your budget is not as difficult as you may envisage. As smaller boats are preferable to behemoth cruise liners, due to the amount of time needed to embark and disembark, our motto is to ‘book the most comfortable small yacht your budget can afford’, rather than spend the same amount of money for a cabin on a very large boat. Then, be on the lookout for special deals, which are usually offered either 6 months ahead of departure date, or our current specials. Some cruises include all drinks, others only non-alcoholic ones. Many carry snorkel and SCUBA gear, but a few do not. Make sure you know exactly what you’ll be getting and you can avoid any disappointment or last-minute expense. This is where it really pays to look at the fine print. Paying for something you won’t utilize, and likewise including a little extra charge for something you will, can make a considerable difference. There are many incredible places on earth one could visit for just a couple days, and return feeling incredibly fulfilled. The Galapagos Islands is not one of them. If this is one of those places you’ve dreamt of visiting for years (if not decades), now’s not the time to skimp on time. To do the Galapagos justice, you need to plan on spending at least a week here, excluding flight days. In fact, a wonderful itinerary would be to take 5 to 8-day cruise, and then spend a couple of days ashore, on one of the islands, experiencing all that this incredible destination has to offer. We offer a range of cruises to the Galapagos Islands to suit all budgets – from outstanding luxury catamarans and yachts, to standard cruise vessels which are just as comfortable and plush as their more expensive counterparts. All are crewed by expert locals and include a naturalist guide for on-shore explorations. Because a trip to the Galapagos is, for the great majority, a once-in-a-lifetime journey…and we’ll make it one you’ll rave about forever.